DESCRIPTION -- Pack of 6 as new and unwrapped boxes of matches which are an early example from the Elder Dempster Line shipping company. HISTORY -- The Elder Dempster Lines was a British shipping company which operated from 1932 to 2000, although its origins stretch back into the mid-19th century. Elder Dempster and Company started trading as the African Steamship Company in 1852. Elder Dempster Shipping Limited was formed in 1899, and in 1932 this company, together with the African Steamship Company, and the British & African Steam Navigation Company, came under the Elder Dempster Lines name. DESCRIPTION -- From the Brocklebank Line shipping company this is a small vase souvenir. The item shows on it a picture of the vessels 'Europa' and 'Niagra' from 1848. The vase dates circa 1960's and is in a near perfect condition with the size of the item being 2" (6.5cm) high. DESCRIPTION -- This item is a rare to find ships timetable from The Canadian Australian Shipping Line. It is taken from 1935 and is in a great condition for an old item like this. HISTORY -- The Canadian Australian Shipping Line. DESCRIPTION -- From the Dutch Shipping Company and is from the vessel M.S. Prinses Margriet (note the unusual spelling) this is an ashtray souvenir which is of a china or pottery make, hand painted and lovingly looked after. The size is 5" (12cm) and it is dated around the 1940's and in great condition. 13/7/39 ' GRAF SPREE ' EXETER ' ACHILLES ' AJAX. HISTORY -- Admiral Graf Spee was a Deutschland-class heavy cruiser (often termed a pocket battleship) which served with the Kriegsmarine of Nazi Germany during World War II. The vessel was named after Admiral Maximilian von Spee, commander of the East Asia Squadron that fought the battles of Coronel and Falkland Islands in World War I. She was laid down at the Reichsmarinewerft shipyard in Wilhelmshaven in October 1932 and completed by January 1936. DESCRIPTION -- Set of coasters/place mats from The Brocklebank Line and there are a total of six in the set and they are still in their original box. The size of the mats is 4" x 3" (11cm x 9.5cm) and the box is also stamped with the name The Brocklebank Line. HISTORY -- Founded in 1801 as Thos.& Jno.Brocklebank, Whitehaven, with one sailing ship, the company traded mostly with coal. With the abolition of the Hon. East India Company's trading monopoly to India in 1813, Brocklebank entered the India trade, which became its mainstay field of operation, but the company also traded to North and South America and to the West and East Indies. In 1819, the company moved from Whitehaven to Liverpool which became its terminus port. DESCRIPTION -- Sugar bowl from The British & Commonwealth Line which is bottom marked and is in a very good condition. The size is 2" (6.5cm) wide and has a typical shipping line pattern from the company. HISTORY -- The Company was originally established in 1955 when Clan Line Steamers was merged with Union Castle to form The British & Commonwealth Shipping Company, a shipping business. British & Commonwealth were the ultimate owners of British United Airways (BUA), Britain's largest wholly private, independent airline of the 1960s, as well as its subsidiaries and sister companies, including British United Air Ferries and British United Island Airways (BUIA). DESCRIPTION -- Side plate as originally used on board ship for the Currie Line shipping company and the size is 7" (18cm) wide and it dates from the 1960's. 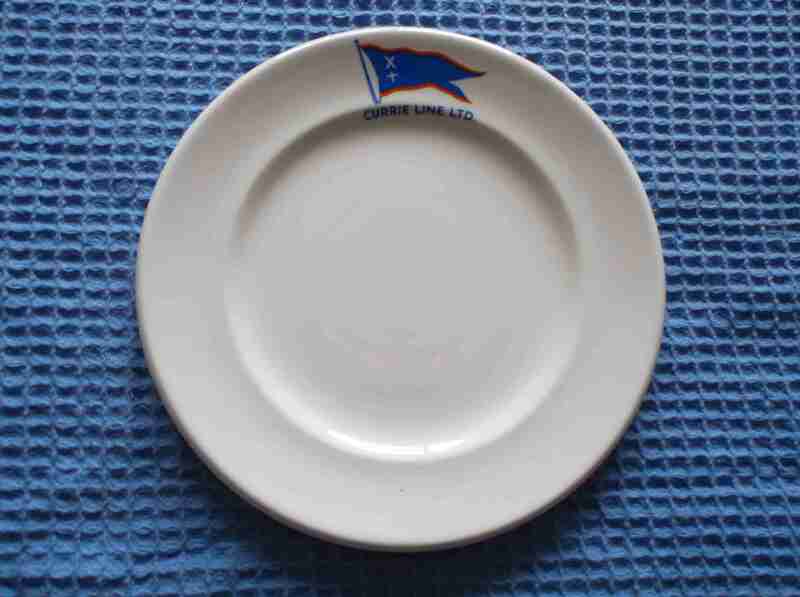 DESCRIPTION -- From the Chandris Line this is a ships dining plate which is in a very good condition and the size is 9" (24cm) wide. HISTORY -- Chandris Line was founded by John D. Chandris, from the island of Chios, who bought his first vessel, the sailing ship Dimitrios in 1915. After the First World War, he purchased his three first steamers, Dimitrios II, Vlassios and Eugenia, trading around the Greek islands. Chandris Line entered passenger shipping in 1922 with the steamer Chimara, which ran a coastal service between Piraeus and Corinth. HISTORY -- The Burns Philp Line was formed in the 1870s and originally concentrated on Australian passenger and cargo coastal trade. In the 1890s trade expanded to the Pacific Islands. The company survived in shipping until 1970 by which time it had disposed of most of it's ships and diversified into other industries.